Rich's Reflections - Rich Gonzalez talks about regional winners and losers, BenJo's vote for the team, New Mexico rivalry, the myth of Californians and mud, and the inspiration of Lucas Walters. Girls - Championship: Manlius NY repeats. Defending champs score 83 points to run away from Newhall CA (Saugus) 171, and Kinetic (Saratoga NY) 194. 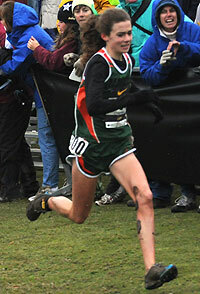 Madeline Morgan of Caution AL (Mountain Brook) wins individual honors. 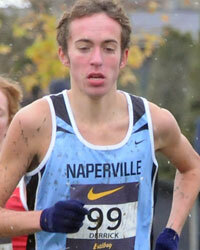 Boys - Championship: Chris Derrick wins race and leads his Naperville IL (Neuqua Valley) team to victory by 2 points over Los Alamos NM, with Albuquerque NM (Academy) a very close third. the teams - our regional editors report what they were saying. Northwest - North Central WA boys, Rose City OR girls, burst into top-10. 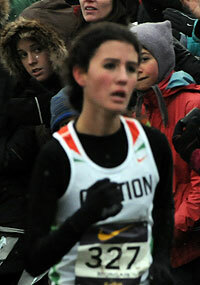 New York and Northeast - Manlius girls lead a New York parade into the top five. Southwest - Battle for New Mexico spills onto Portland Meadows. Southeast -Morgan's individual win pulls Caution AL to sixth-place finish. South - Lowe bids farewell to Portland Meadows with silver medal finish. California - Runner-up Newhall girls end California drought in the NTN top five. Coach Kedge's Blog - Albuquerque coach tells how NTN affects his team - Blog 6: highlights of the championship weekend. 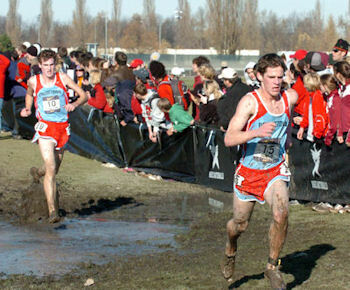 Portland, Oregon—In the first three incarnations of the Nike Team Nationals, despite the best efforts of cross country squads from the far reaches of the nation, club teams from either Illinois or the Northeastern US—and primarily New York—have kept a stranglehold on the boys’ and girls’ championship titles. That didn’t change Saturday at the 4th annual team national event, as Naperville IL (Neuqua Valley) followed individual winner Chris Derrick across the line for a narrow two-point victory over Los Alamos NM in the boys’ race, and the Manlius NY girls (Fayetteville-Manlius) successfully defended their 2006 title with a sterling 83-point run which left them well clear of runners-up Newhall CA (Saugus). The blustery, snow-dusted day began with the impressive sight of a clutch of Kenyan boys picking their way along the driest sections of a muddied course, knifing through the wind en route to a perfect score of 15 in the Boys Open race. Last year’s Open winner, Paul Lonyangata, was fourth for the Kenyan contingent this year, but all five runners were under his 2006 winning time, led by newcomer Justine Cheruiyot in 15:24.6 and last year’s runner-up, Philemon Rono, second again in 15:27.2. The first American across was Demitri Goutos (Apaches), sixth in 16:34.8, while the top US squad in the Boys Open was Vista Murrieta CA, trying to make up for the disappointment of missing an at-large bid to the championship race with their 61-point runner-up showing. The scoring in the Girls Open race was slightly closer, due to a toothache that severely hindered Kenya’s fifth runner, Emmy Kerich, and left her well back in the field. Up front, however, her teammates easily secured the top four places behind Valentine Koech’s 17:59.5 victory. Jessica Barnard (Little Branch CA), was the leading US finisher, grabbing fifth place with her 19:38.9 tour of the course. Dana Hills CA managed to scramble closest to the Kenyan contingent with their 86-point second place effort. Next on the slate was the Boys Championship race, which promised not only a compelling team battle, but a riveting individual clash between favorites Chris Derrick (Naperville IL), Colby Lowe (Carroll TX) and Ben Johnson (Albuquerque NM). The early stages of the race held to form as those three separated in the opening mile, but then Lowe and Derrick drew clear as Johnson slipped off the back into no man’s land. Lowe and Derrick would duel until the final kilometer, when Derrick pulled away for a 15:39.8 win that would have placed him firmly among the Kenyan pack in the Open race. Lowe was only a few strides back in 15:42.8, while Johnson held on gamely for third in 16:20.7. Derrick’s Naperville team certainly needed his single-digit starter, and an epic run from rebounding #2 man James Riddle (6th – 16:26), as they barely held off a surging Los Alamos NM squad in a two-point thriller, 125-127. Los Alamos placed their top four within a mind-boggling 7 seconds of each other to upset the formcharts with their valiant second-place run, and cap a tremendous season for New Mexico squads which also saw the Ben Johnson-led Albuquerque team finish third with 134. The Woodlands TX, which led through the early kilometers after an ambitious start, held on for fourth, with 197 points. The Girls Championship race saw no such drama in the team scoring, as defending champions Manlius XC asserted themselves in the opening kilo and never let up. Placing three in the top ten of a field which featured multiple Foot Locker-caliber individuals, Manlius simply dominated the team competition, scoring 83 points to Newhall CA’s 171 and Kinetic’s (Saratoga NY) 194. Hanover NH (4th – 206) and Burnt Hills NY (5th 209) made it four teams from the Northeast in the top five slots. Sixth place squad Caution XC (Mountain Brook AL) was fronted by perhaps the biggest surprise of the day: junior Madeline Morgan gapping pre-race favorite Katie Flood (Des Moines IA) in the closing kilometer to post an 18:54.5 victory. Morgan had impressed with big performances early-- 2nd at the Bob Firman Invitational--and late--winning at the NTN Southeast regional--but was nonetheless flying slightly under the radar compared to some of the other girls in the race. Flood stayed close for second (19:04.3), while hard-charging NTN NY Regional winner Samantha Roecker (Burnt Hills NY) blew past Kinetic’s Hannah Davidson on the homestretch to claim third (19:06.9) to Davidson’s fourth (19:08). On a day when the course gave snow, wind and mud, and didn’t give an inch, Aris’ Manlius team and the Naperville IL boys proved they had what it took to handle the challenging Portland Meadows layout, and guaranteed it will be at least another year before the winged Nike trophy resides somewhere other than Illinois or the Northeastern US. In 3rd kilometer, Kenyans are running their own race. Rich Gonzalez Defending champion Manlius NY girls seem unstoppable - Dana Point CA is the pick in a balanced boys field. Marc Bloom The Harrier editor picks Manlius NY to make it four straight titles for New York girls and Neuqua Valley IL iin the boys race. How to run Portland Meadows - the "real" secrets - Coach Kedge Blog#5 responds to those who said he gave away secrets in Blog#4. Learn about the sprint-walk technique. How to Win NTN, by 3 who did it - Sean McNamara (York IL '04), Amanda Griggs (Hilton NY '05) & Kyle Dawson (Coatesville PA '06) tell about their trip to NTN finals. Kenyan Pack, coming back - Dave Devine previews this year's Kenyan team, traveling to compete in the boys and girls Open races for the second year in a row. 44 teams - 22 boys and 22 girls, with 32 determined by 1-2 finishes at eight regionals. A seeding committee picked 4 California teams and 8 at large teams. 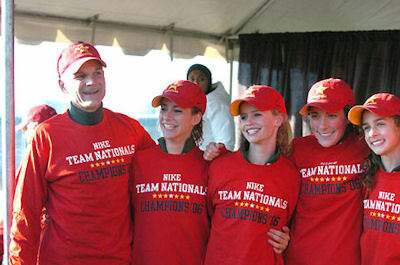 Three years ago Nike Team Nationals blazed new ground. Jumbo video screens, live video of the race, national webcast, interim standings and scoring every 1000 meters, European style course with hay bales and camel back hills. This year, the 4th NTN marks another step up with regional championships. Instead of rankings, face to face competition determines the teams qualifying for the finals in Portland. The top two boys and top two girls finishers at regional championships in November earn a trip to Portland for the finals December 1. Last year's champs . . .
Fayetteville-Manlius NY coach Bill Aris and his girls after their smashing victory, which climaxed a season-ending flourish of three straight wins -- the New York public schools state championship, the New York Federation championship and NTN. Aris brought his US#1 boys team to NTN the last 2 years without winning, but grabbed the title this year with a girls team that was out of the running for NTN until winning the New York championships. They are ranked US#1 this year by Marc Bloom's The Harrier magazine, so they could be back in Portland to defend their crown..
Coatesville's 2-3 men Sean Ward and Owen Dawson, who finished 20th and 21st, slog through mud near the finish line.